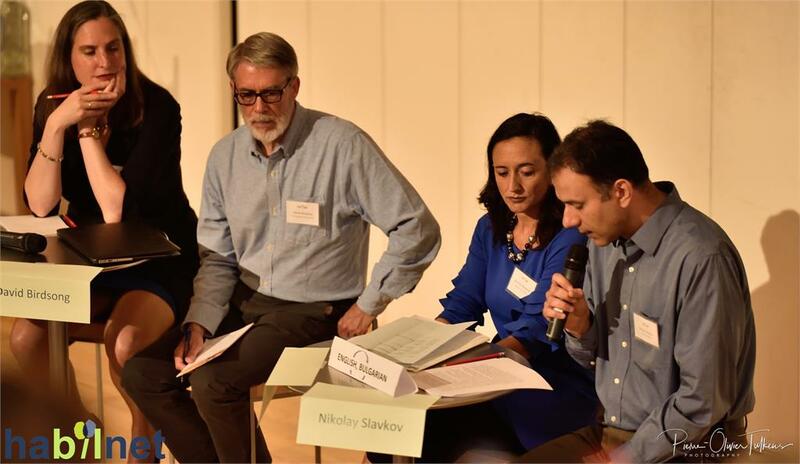 On May 24-25, Nikolay Slavkov, CCERBAL Director, and Christopher Fennell, OLBI Research Chair in Second Language Acquisition and Learning, represented the University of Ottawa at the inaugural Symposium of the International Harmonious Bilingualism Network, which took place in La Hulpe, Belgium. The event was organized by world renowned experts in childhood bilingualism and second language acquisition, Annick De Houwer (Universität Erfurt) and Lourdes Ortega (Georgetown University). This symposium on the study of bilingualism hosted a series of thematic panels, posters, and special student mentoring sessions. Topics discussed included demographic, social, and cultural variability, ethical considerations, terminological issues, monolingual, bilingual and multilingual norms, as well as pitfalls of and opportunities for transdisciplinary research into bilingualism. The event also celebrated the forthcoming Cambridge Handbook of Bilingualism, co-edited by De Houwer and Ortega. In June, members of OLBI’s Research Group in Languages and Technology (GRILT) were very active, having organized a symposium and presented at a conference. The symposium, entitled “Technology in language teaching. Stories of mixed marriages: in person and at a distance!”, was held at the University of Ottawa and attracted approximately thirty people who listened to presentations by Marie-Josée Hamel, Research Chair and Director of the GRILT, Laura Ambrosio, Marie-Claude Dansereau, and Martine Rhéaume, all of whom have transformed and taught their classes in hybrid formats. Participants also heard testimonials from Catherine Mongrain, an OLBI student, and two experts who presented technological tools related to language teaching: Laura Wheeler, Faculty of Education, and Pascal Wickert, Director of Operations and Communications at uOttawa’s Teaching and Learning Support Service (TLSS). On June 25 and 26, Marie-Josée Hamel, Marie-Claude Dansereau, and Martine Rhéaume presented a workshop on the development of blended learning initiatives at OLBI at the International Conference on Second Language Pedagogies (SLPC 7) in Victoria, B.C. Both the GRILT symposium and the SPLC 7 workshop were well received and promoted our initiatives in using online technology for language learning to numerous colleagues from Canada and abroad. We are excited to announce that a team of researchers, including one of our professors, Dr. Beverly Baker, has received a research grant to continue their studies in the field of Canadian bilingualism. The team’s research investigates how ESL and FLS teachers negotiate their developing identities in becoming effective second language teachers in contrasting English and French majority settings in Canada. Stay tuned for updates on this research! From June 27 to July 15, 60 Francophone grade 8 and 9 students from across the country came to the University of Ottawa for the annual Destination Clic program. Over the course of three weeks, the participants had the chance to practice the language of Molière and fully immerse themselves in La Francophonie thanks to a wide range of events centred on language learning and Francophone socio-cultural development. Destination Clic offered many events, ranging from literature courses to video editing workshops, music concerts, and theatrical plays. In summary, the program was a success for another consecutive year! We would like to thank all those who helped in the organization and logistics of the program, as well as the young students who participated. Attention uOttawa Staff: Improve your Second Language this Fall! Whether it’s a lack of time, a daunting task or another reason, there are many excuses we come up with not to register for a language course. Take advantage of this great and free opportunity, offered in an open setting without judgement, to learn certain things you haven’t yet quite mastered. The Official Languages and Bilingualism Institute and the Human Resources Department of the University of Ottawa are uniting to offer language training adapted to your needs.